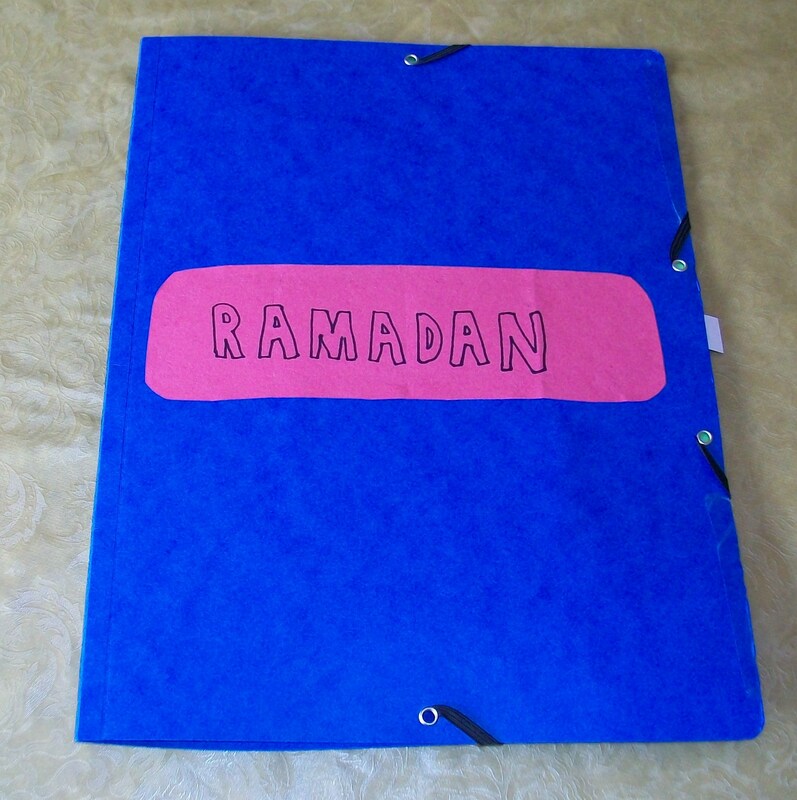 My friend, Umm K, has made this beautiful Ramadan lapbook. All handmade, lots of detail and no printouts! Lots of different information on Ramadan could be included in here. 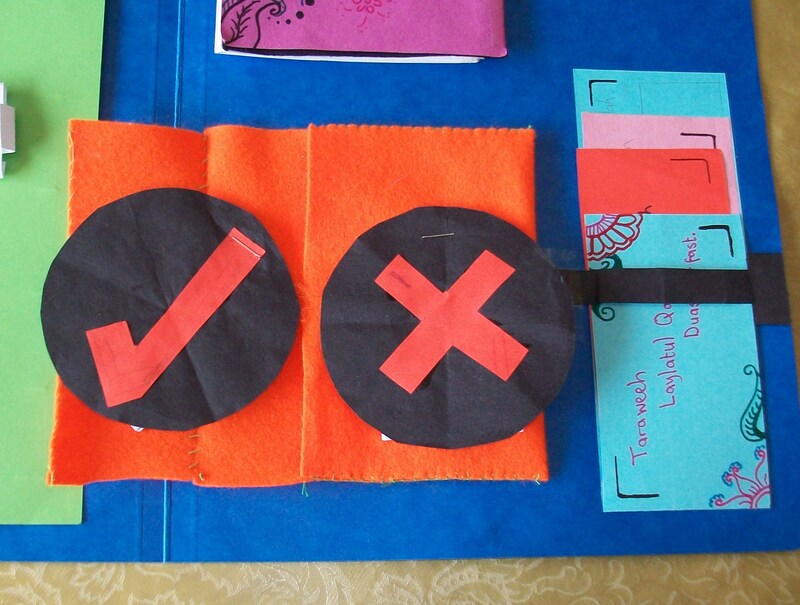 Below the facts mini book Umm K has sewn a felt pocket, inside which there are two minibooks of dos and don’ts. 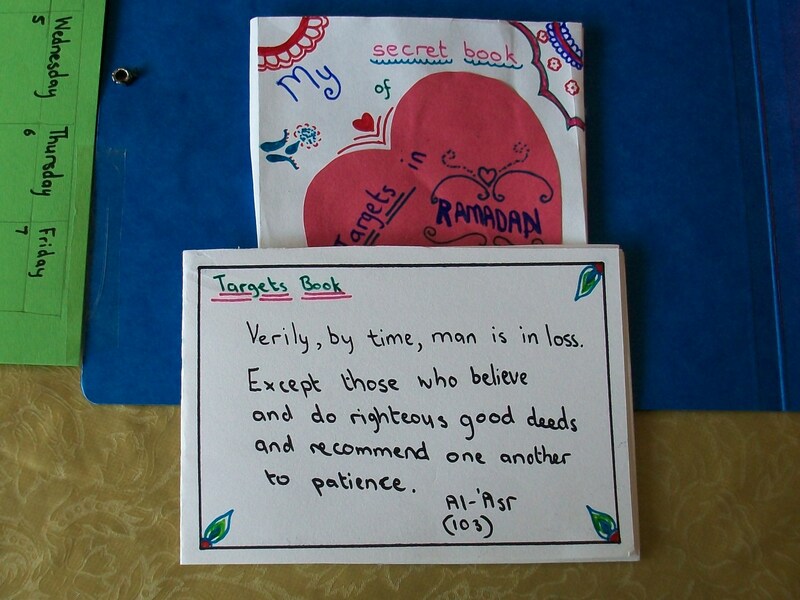 Actions to be encouraged in Ramadan, such as reciting more Quran and giving saqaqah, are inside the circular minibook marked with a tick (or check), and actions to be avoided, such as lying, backbiting are inside the book with the cross. On the other side from the covers are the mini books of a few stapled pages. 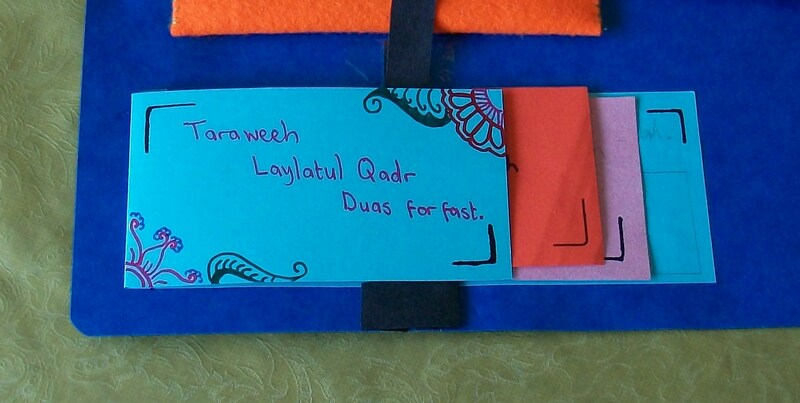 The last mini book on this side of the lapbook is a three page layer book on information relating to Taraweeh, Laylatul Qadr and duas. I really like all the decorative touches, maashAllah. On the left half of the lapbook there is an extension page. When folded in the extension page has a checklist for daily ibaadah, including completing of all prayers, Quran memorisation, recitation and study of tafsir, and a selection of good deeds; smile at a Muslim, give a present or food, gain knowledge of Islam, go to meet another Muslim, visit an ill person. These are suggestions, the checklist can be tailored to suit the individual using it. The checklist is on a piece of A4, folded in thirds, business letter style. Inside is space for making notes on achievements and goals for Ramadan, maybe prayer times, notes on dhikr, whatever you choose. The checklist is supposed to be used as a tool for a Ramadan active with ibaadah, inshAllah. When the extension page is folded out, on the other side of the checklist is a calendar for the month, to be used along with the checklist, inshAllah. The other two mini books in this section are the “Rules for Fasting ” mini book and “Targets in Ramadan” secret book. The photo above shows the minibook and the decorative pocket which it slots into. 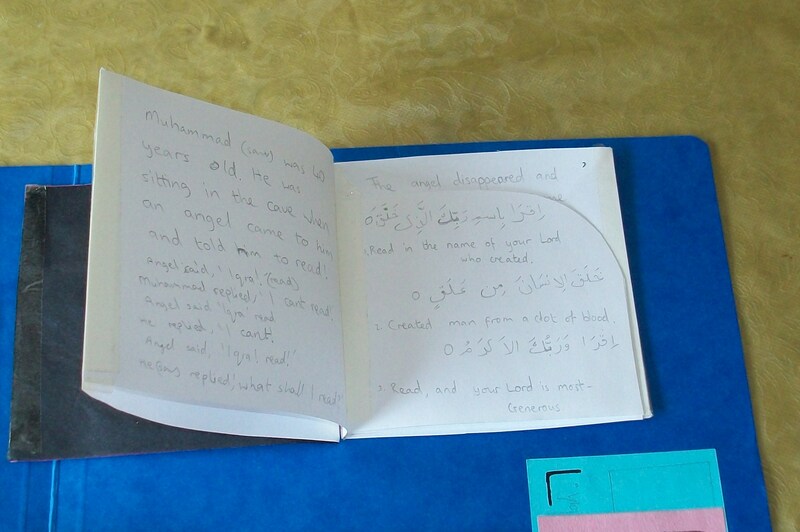 The booklet is simply papers folded and stapled together, with the verse from Surah Al-Asr and decoration on the front. ( Click on the photo to enlarge it.). Inside the pages are left blank, to be filled in with personal targets for Ramadanand other journaling. The booklet fits into the decorated pocket for storage. The simple decorative touches with the coloured markers make it look special, maashAllah. 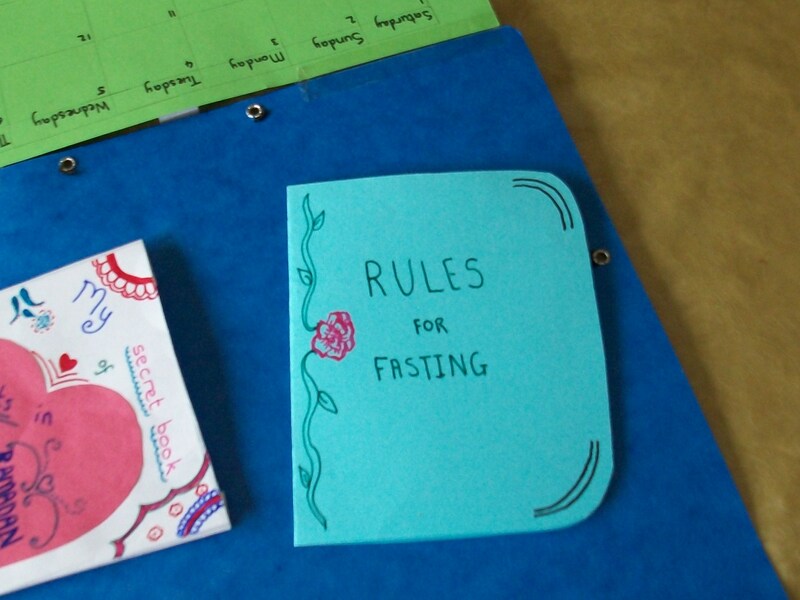 The last mini book is the one on rules for fasting. The cover is made from card. Inside, the booklet is divided into sections, with little tabs made by sticking pieces of coloured paper onto the pages, marking the sections. There are sections on what is permitted while fasting (using miswak, swallowing own saliva etc), what invalidates the fast (deliberate eating or drinking etc) and lastly, a list of those exempted from fasting, (the sick, the traveller etc.) The level of detail in this section can be expanded the older the learner is. 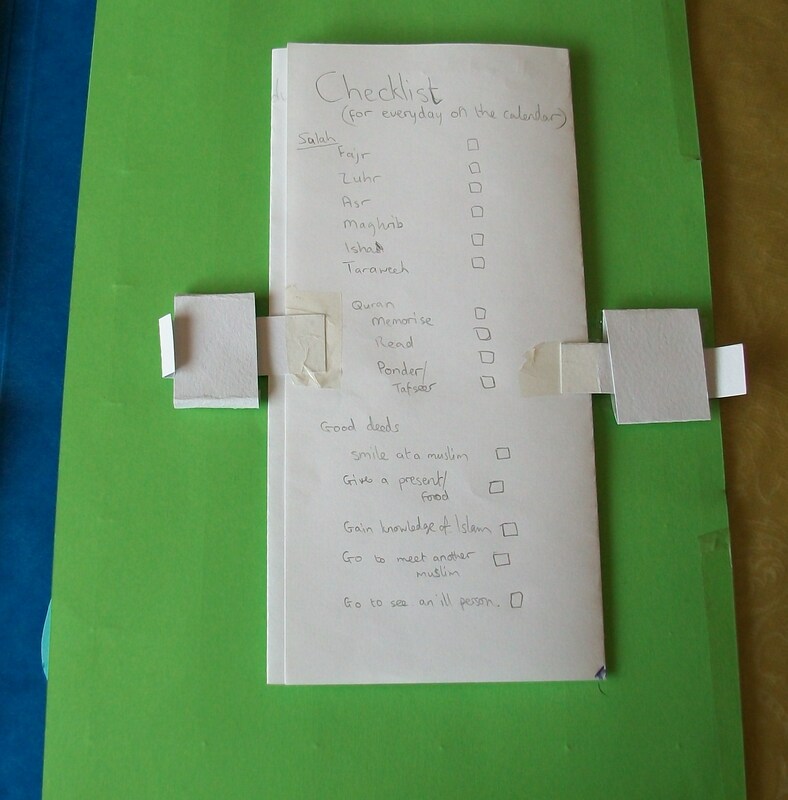 I really like the way Umm K turned this lapbook into a really personal and active learning tool, with the inclusion of the checklist and journal. It is good for young learners trying out fasting, and also great for young people experiencing their first compulsory Ramadan. 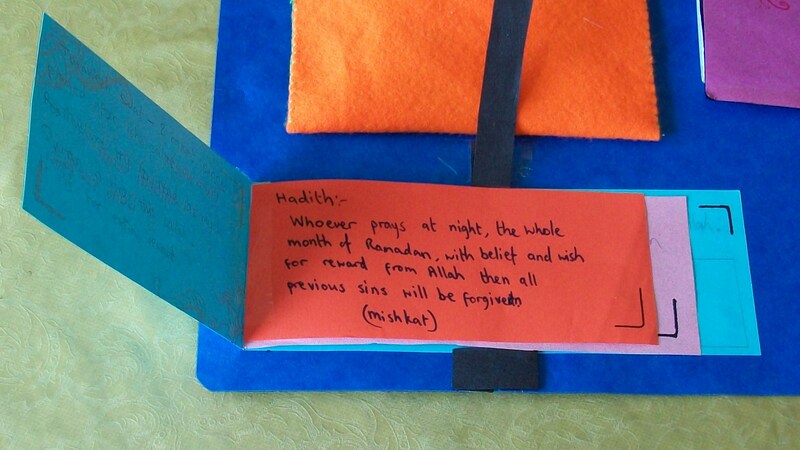 This is an idea I used with my children a couple of Ramadans ago. It is an activity which can be enjoyed by all ages throughout the month, inshAllah. 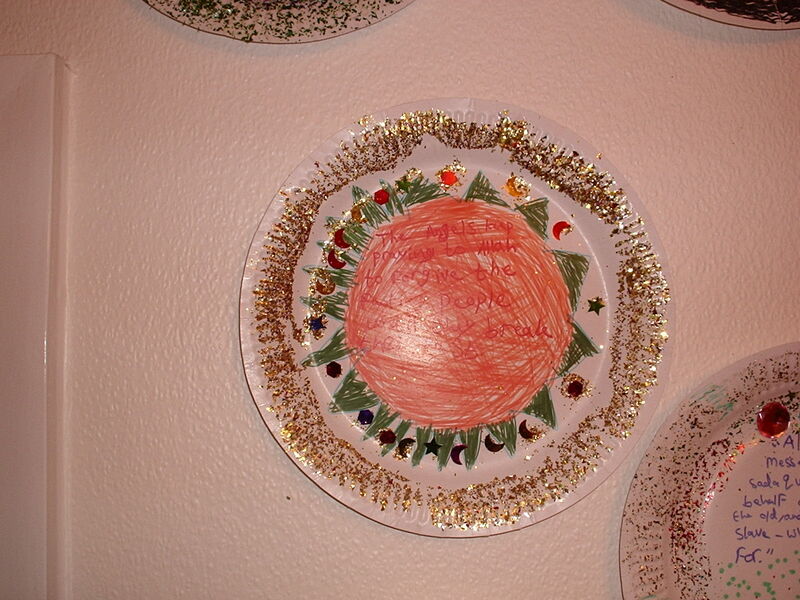 As the plates were made we stuck them on the walls, so that by the time Eid arrived we had a brightly decorated room! 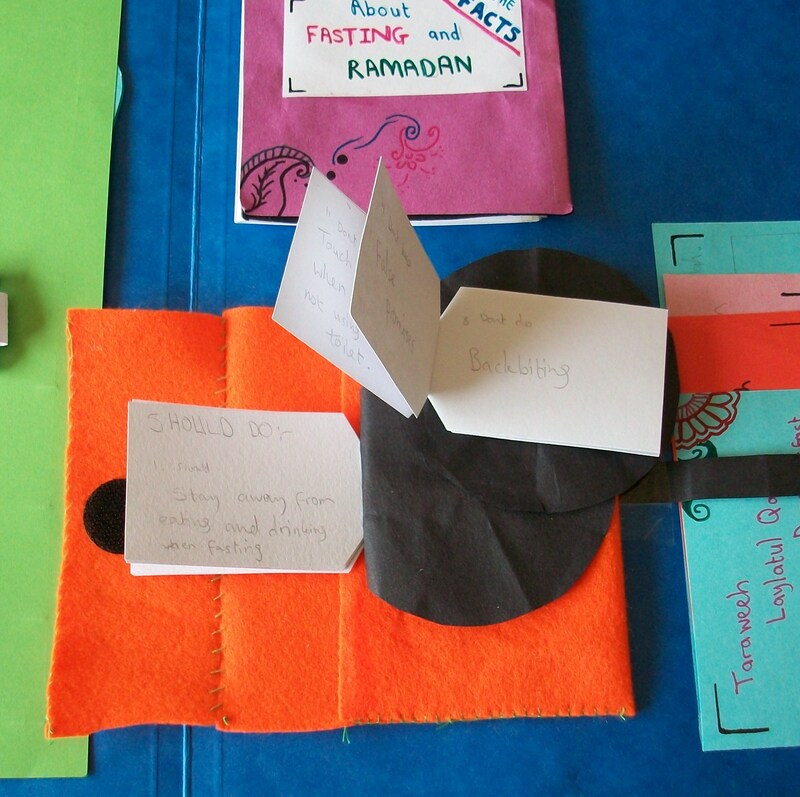 We used paper plates and reference books containing hadith and ayat about Ramadan, fasting, Lailat al-Qadr etc. 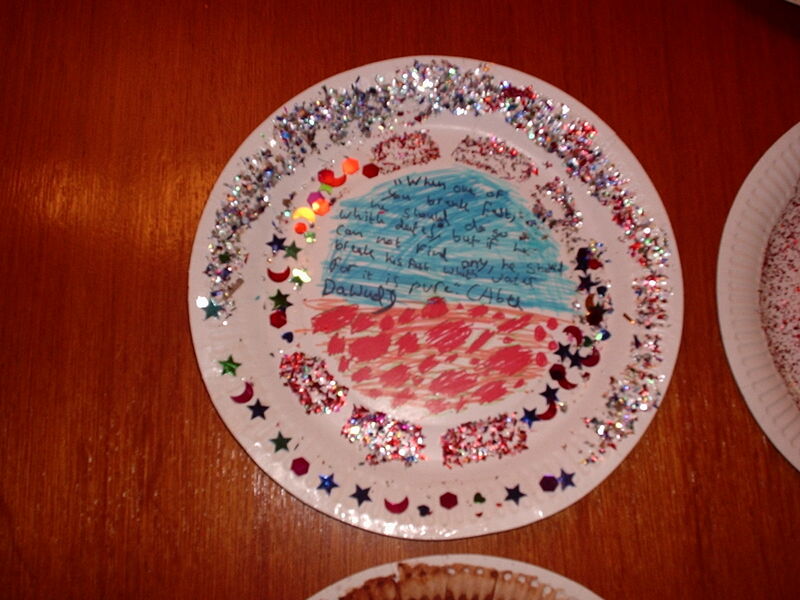 Every day we would choose a hadith or ayat to study, then the children would copy it out onto the paper plate, and decorate it with craft materials, paints etc. 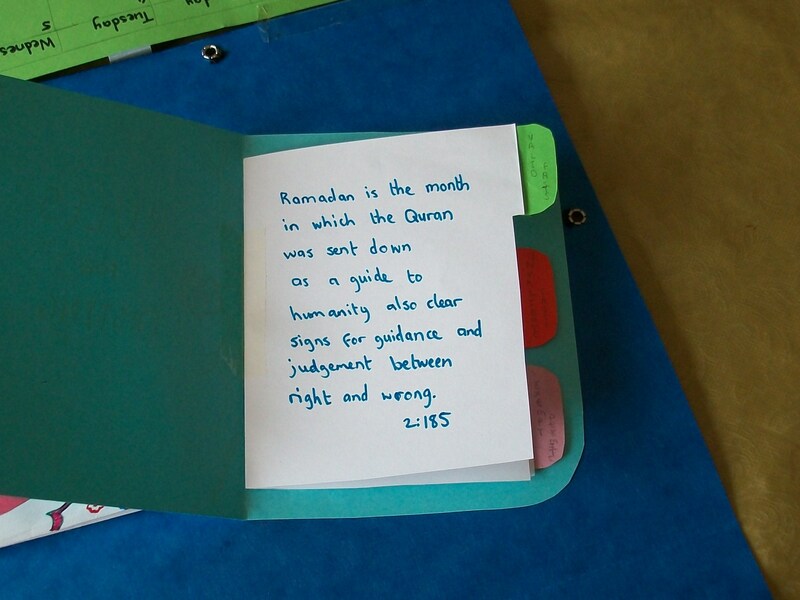 One of the children was too young to write out the hadith, so she decorated words like “Ramadan”, “fasting” etc instead. 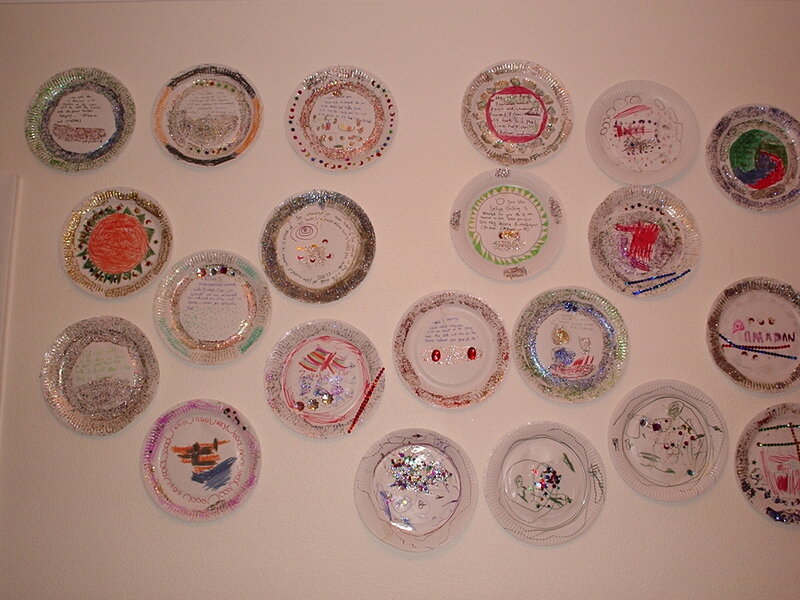 We used plates to symbolise the idea that when we fast we are filling plates with worship rather than food. Lapbooks are so versatile! 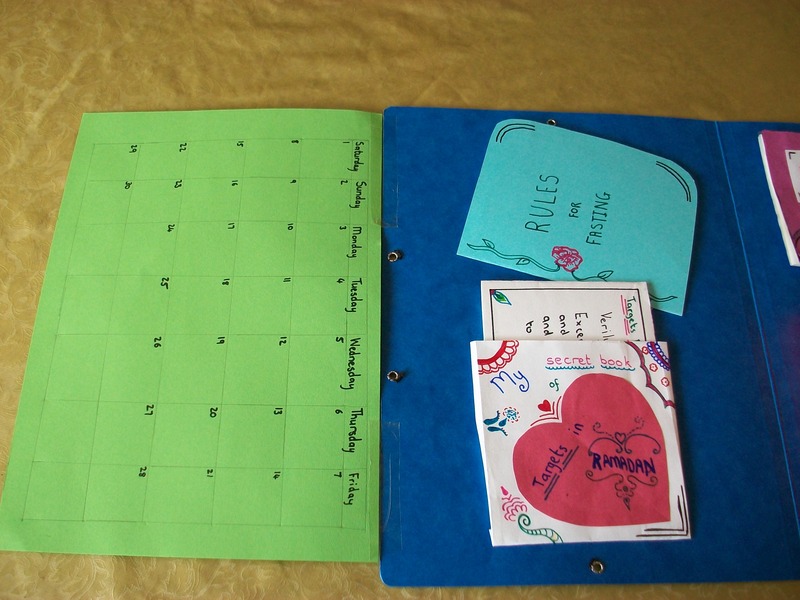 Have you thought of using a lapbook to present a book review? 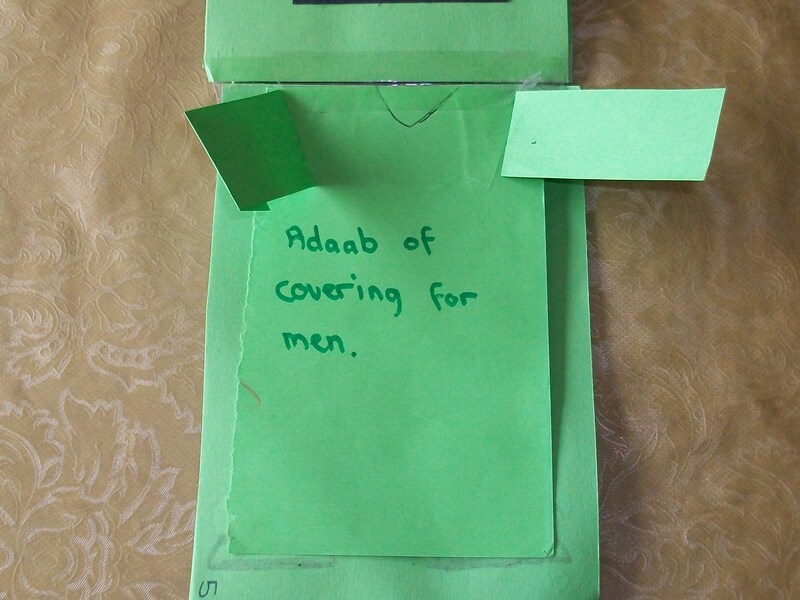 In this example a friend’s younger brother made a lapbook about a book that he enjoyed reading. – Write about a favourite or important character. – Write about the story setting. – Write a summary of the story, you could do this in comic strip form inside an accordian book. 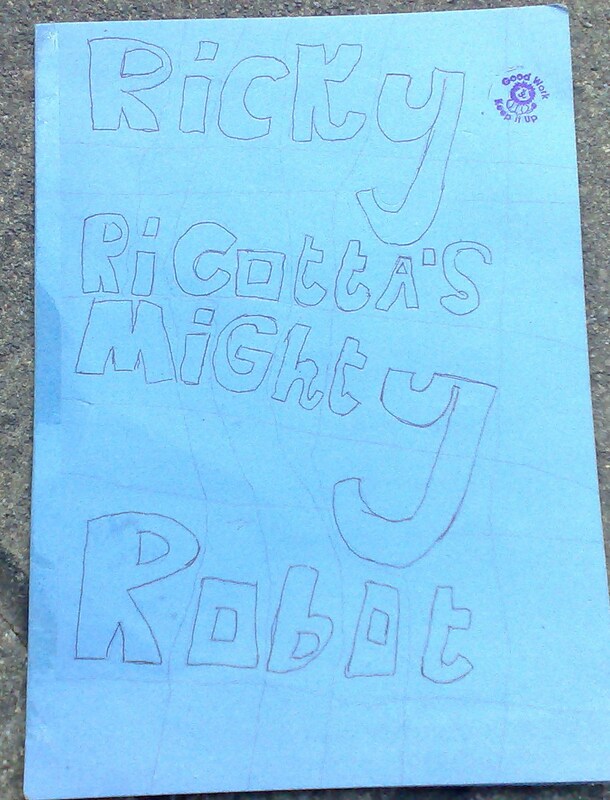 – Write themed vocabulary lists.For example this book was about robots, so make a robot words list. – Write about what you liked or disliked about the story. Use lots of drawings, colours and shapes associated with the story. Even deciding what pictures to include is part of the book review process, recalling the places, characters and objects from the story. 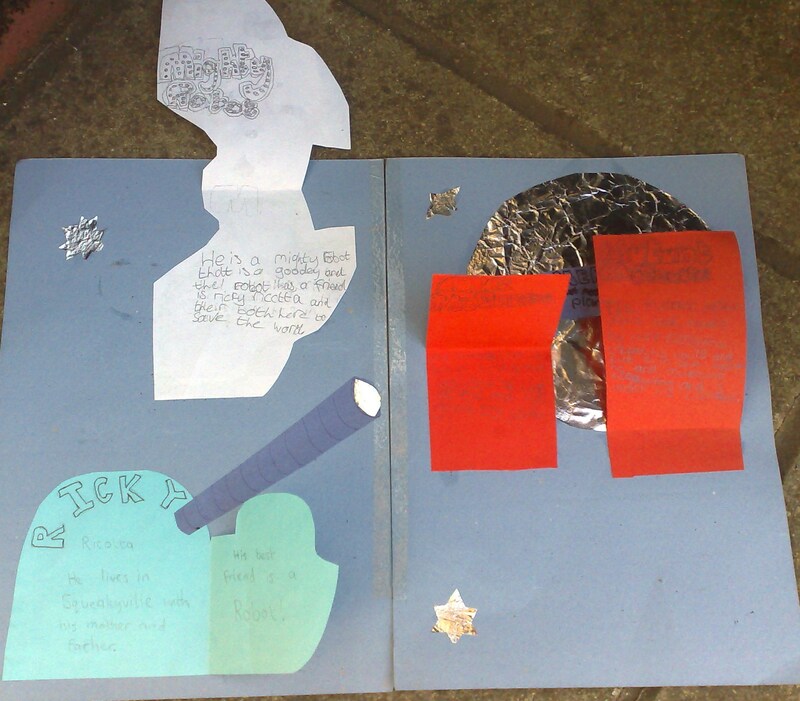 In this lapbook there were stars, a telescope and a silvery planet to illustrate. This type of lapbook project is great for a child to do all by himself, as the only reference source required is a book of his choice. Something different for the summer maybe! InshAllah. This very simple notebook is a collection of Islamic stories illustrating the key concept “Good deeds help you get to Jannah”. Another sister first worked on this project a few years ago, and I have recently reworked it with my 6 year old daughter. For my daughter’s project we used six stories, studying one at a time. We would read the story through, then she would write a little about it, and draw or colour a picture. This project could be done with any age group. The idea is to collect stories which can reinforce the concept of reward for good deeds. There are many of these, which can be found in Islamic children’s books and websites.We also included the story of the woman who was promised punishment because she was cruel to her cat, for the sake of contrast, and as a reminder of why it is so important to try to perform good deeds, inshAllah. 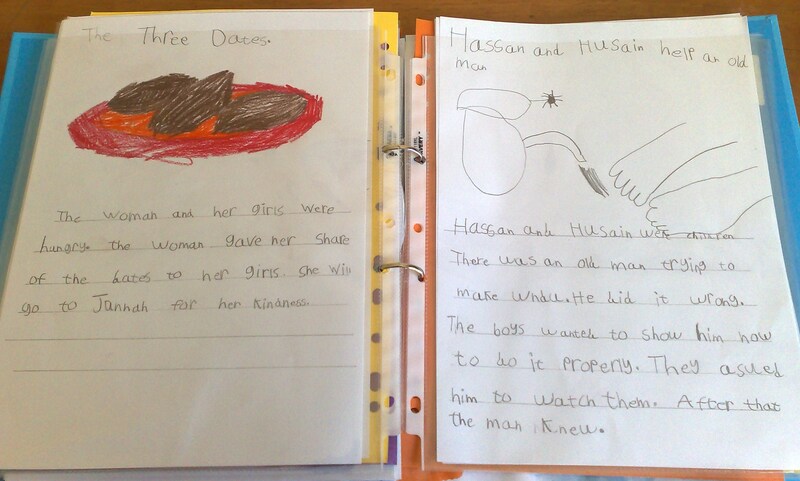 The pages above show the work done on the story of the woman and the three dates, and the story of when Hasan (ra) and Hussain (ra) showed an old bedouin how to perform wudu. More stories can be found here and here. The cover shows a pathway leading towards the word “Jannah”. I asked my daughter to think of lots of good deeds and to mark them along the pathway. 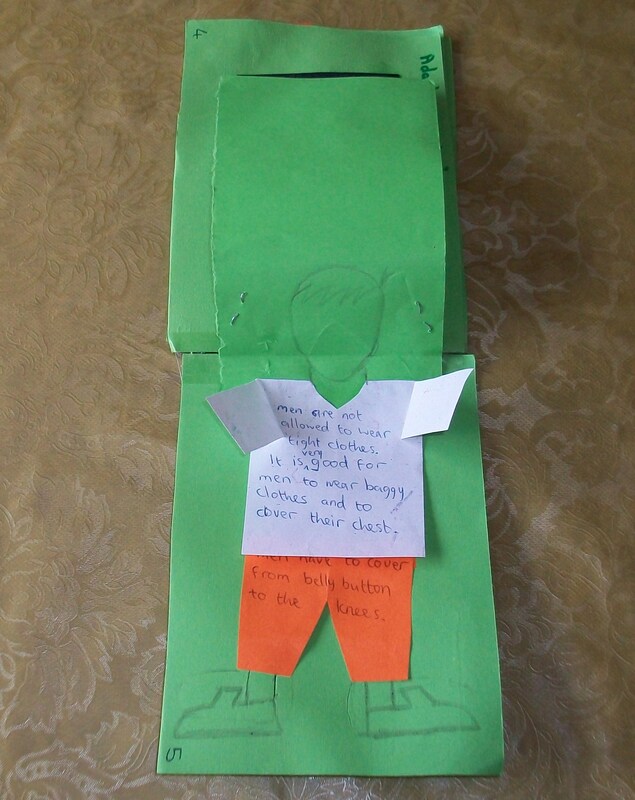 Making the cover at the end of the project helps to check how the concepts of good deeds have been absorbed by the child. 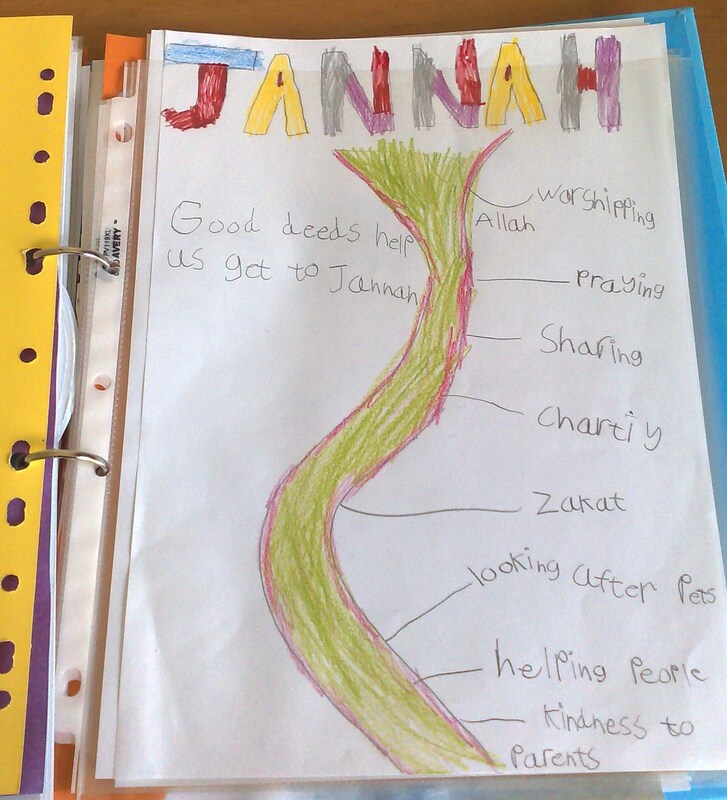 She also wrote “Good deeds help us get to Jannah” on the cover. 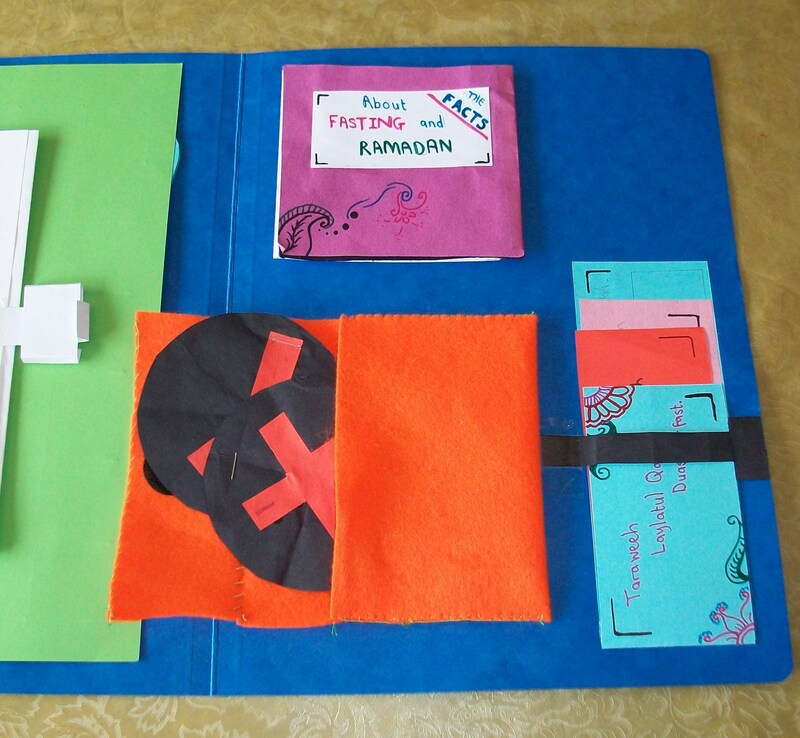 This minibook is an illustrative sample, made for use with a group of girls in their early teens. 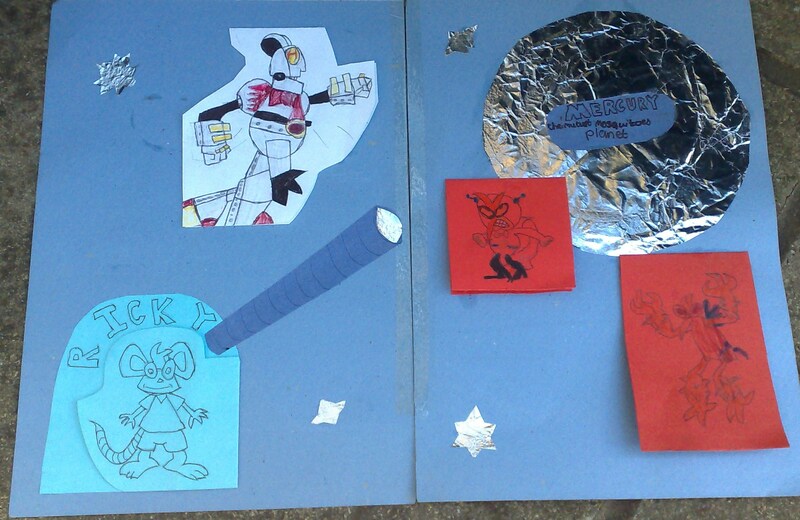 The girls are to make their own books, based on the example. A friend of mine made this minibook. It really is a “mini” book, measuring 12 x 10cm, and the pages are pieces of card taped together. Inside the cover is a table of contents, then on the first page there is the adaab of giving salaam. I have compiled a PDF with the references used in this minibook which can be printed out. Link at the end of the post. 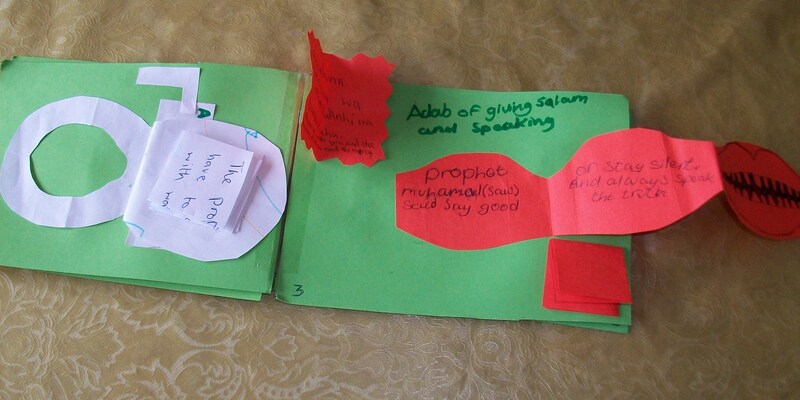 The hadith relating to salaam is given on the page, and the words of the salaam are given in the fold out shapes. The mouth opens up as an accordian book, with a hadith cautioning the tongue to fear Allah. (Hadith in PDF). The page on the adaab of covering has a lift up khimar and abaayah. Underneath is an evidence on covering. (see PDF). The next pages concern the adaab of visiting the ill and of entering a majlis (gathering). The hadith for this section are in the PDF below. One is written above the bed, the other on the liftable bed cover. This opens out, like shutters. On the pink paper is written the evidence for adaab in a majlis, (see PDF). On the other side the drawing of a house opens up to reveal evidence for asking permission before entering a place. The next page is about reciting Quran. Advice on the manner of recitation is written inside the booklet pages. The next page is about walking. Here the hadith is written next to the cut out foot shape. The last page contains advice on correct use of the toilet, (use of the right hand), written on a toilet cut out. I have made a PDF file of all the evidences used in this minibook, in case you would like to use them for your own project, inshAllah. 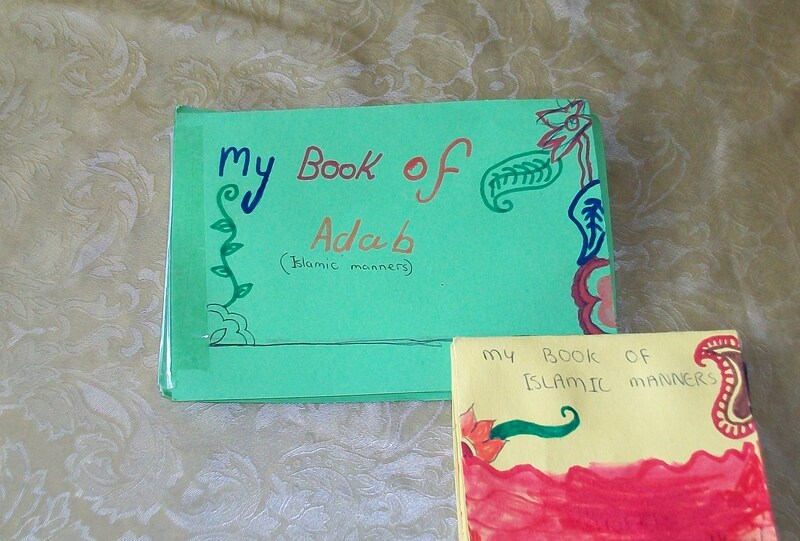 Here are some examples of the adaab mini book adapted for younger children, aged around 6-8. There are fewer examples, and the language used is simpler. These pages give advice on bathroom manners, and the adaab of giving salaam and speaking. Simple shapes illustrate the themes. and a trouser and top underneath, with the information written over it!! I think that the study of Prophet Dawud (as) is well suited to a lapbook because there is relatively little information on this Prophet, and what there is consists mainly of short facts. My sons completed this lapbook study over three days. The picture shows two lapbooks, one for each son. The central piece of writing is an account of how Dawud(as) killed Jalut in a battle, as described in Surah Baqarah:251. On the top right is a simple folded book with a mountain picture on it. Below that is a hand shaped section with the following hadith written on it, “The best (food) man eats is that (he eats)out of his earnings and the Prophet of Allah, Dawud ate from what he earned with his hands” Abu Dawud , 3528. On the left of the lapbook, the top section is a simple folded book with a balance scale on the front. Inside are a few sentences about the kingdom and authority given to Dawud (as) and about his judgements between the people, such as mentioned in Surah Sad:24. I sincerely hope the above information is authentic and correct. Any mistakes are my own fault. This minibook was made by a friend of mine. In this project the art and craft is just as important as the bee information. The project is inside a hive shaped book, which is several centimetres thick. When opened up you can see that the project is based on the hexagon shapes of the honeycomb. At the top there is a folded diagram of a bee, two cut out felt bees and a hexagon mini book that folds out and out, as I will show in another picture below. On the bottom section a series of hexagon boxes has been assembled, with accordian style mini books of information stuck inside some, and in others there is a simple lid, with information stuck down underneath. The hexagon boxes were made by folding strips of card into shape, then taping them in position. Bee diagram, unfolded. This is in the top left corner of the project book. Here the series of hexagons starts to unfold. Each hexagon is covered with either a flat or a folded paper containing bee facts. The hexagons are taped together, so that they can be folded out one at a time. The picture above shows the hexagon boxes fully opened up. All contain bee facts.